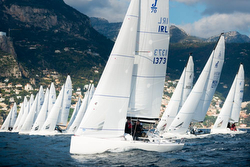 (Monte Carlo, Monaco)- The premiere offshore one-design keelboat event of the spring, the very popular Primo Cup- Trophy Credit Suisse, will be taking place this weekend for a huge fleet of fifty-four highly competitive J/70s from across Europe and other parts of the world. Those teams hail from Monaco (14), Switzerland (11), France (6), Germany (7), Italy (6), Russia (5), Ireland (2), Brazil (1), Great Britain (1), Finland (1), Ukraine (1), and Sweden (1). As they have for years, the Yacht Club Monaco is welcoming the enormous fleet with their extraordinary red carpet treatment, welcoming all sailors to their gorgeous setting on Hercules Bay. The tempo and the competitiveness level of the J/70 fleet continues to increase as many teams are increasingly focused on the fact that YC Monaco will be hosting the 2022 J/70 World Championship. Based on what happened in Act III of the Monaco Sportsboat Winter Series for J/70s two weekends ago, most competitors will be wondering if the theme of “the Russians are coming, the Russians are coming” will repeat itself in the face of heightened competition. Surely, the winner of both the Open and Corinthian Divisions, the Russian Andreï Malygin skippering MARIA, will be doubling down their efforts to stay atop the leaderboard. And, the balance of the top five that included two YC Monaco crews (Loïc Pompée’s ALLO III and Ludovico Fassitelli’s JUNDA- BANCA DEL SEMPIONE), two Swiss crews (Florian Geissbuehler’s ATTAQUE and Laurane Mettraux’s CER APROTEC VILLE DE GENEVE), and the top Irish team (Marshall King’s SOAK RACING) will all battle hard to remain in the top five. For more J/70 Primo Cup Trophee Credit-Suisse sailing information Add to Flipboard Magazine.